It would appear that digital audio music devices are getting more and more personal – people are using their mobile phones, streaming services and more with their headphones plugged in. For people wanting to turn up the volume, Bluetooth speakers have continued to grow in popularity. From the outside, it almost appears that the micro-component systems and amplifiers of old have reached a saturation point. In Japan, though, I spotted that the industry seems to be quite alive and well. I saw a bunch of new models with High Resolution Audio proudly displayed and this one specifically caught my eye! This is such a desirable little device – 11cm wide! 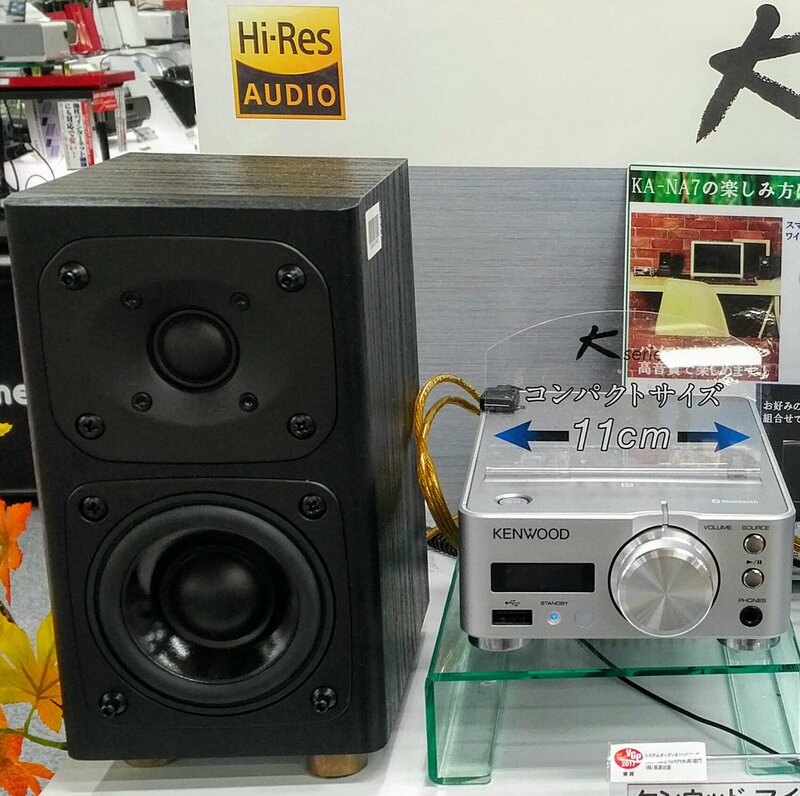 Obviously, we know that the Japanese industry likes to miniaturise devices and this amplifier is no exception. This is the Kenwood KA-NA7 Integrated Amplifier and is just 11cm (4.33 inches) wide and packs everything you need for your digital devices. Of course, many of us watch and listen to stuff on our PCs. The KA-NA7 allows you to connect your PC or other player using a standard analog cable. But this is a device made for the digital age – it features a built in USB DAC so you can connect a USB port on your PC using a standard micro-USB cable to the back of the amplifier. This means that the KA-NA7 acts as a “USB sound card” for your PC and completely bypasses the crappy sound card on your laptop to deliver great sound. Note that speakers aren’t included and you’ll need to find something that works for you with this set – of course, you could just plug in your fancy headphones to these! With all the sources passing through this, you can use this as a headphone amplifier or connect it to a set of speakers to play back room filling sound. First, it doesn’t have an FM radio – I still listen to a lot of stuff on regular radio. So, it would have been fantastic to have that. That said, I’m not buying radios in Japan since they won’t tune to the frequencies in Singapore anyway. Second, it doesn’t have any network connectivity – no Wi-Fi, no LAN, nothing. So, yes, it’s an amplifier as the name suggests. I didn’t get to try the device at the shop where I saw it – but that’s on my list for the next time I’m in Japan.